Once again, I have been away quite a while from my blogging. I’ll be posting more often now though. So many things have happened since my last post in June regarding my Criterion RV-6. The whole scope has been completely restored, to better than new condition actually. I had the whole process well documented though, which can be seen here. So this summer I have been thoroughly enjoying using this telescope, it’s the finest 6 inch Newtonian I have ever looked through. I have also upgraded many of my eyepieces as well to suit the RV-6. I have a few main eyepieces that I use on it. My low power “wide field” eyepiece is a GSO 32mm Plossl. This is really a great eyepiece for the money. Fully Multicoated, excellent transmission, etc. I have a mid power eyepiece, an Astro Tech Paradigm 12mm. These Paradigm eyepieces have become very popular for their unbelievable quality for their price, only $60 each in all the focal lengths, from 25mm to 5mm. They have a 60 degree field of view, and are very well corrected. I only have the 12mm right now, but I’ll definitely be getting more of these. Available here. I’ve been making many sketches too, all with the RV-6. 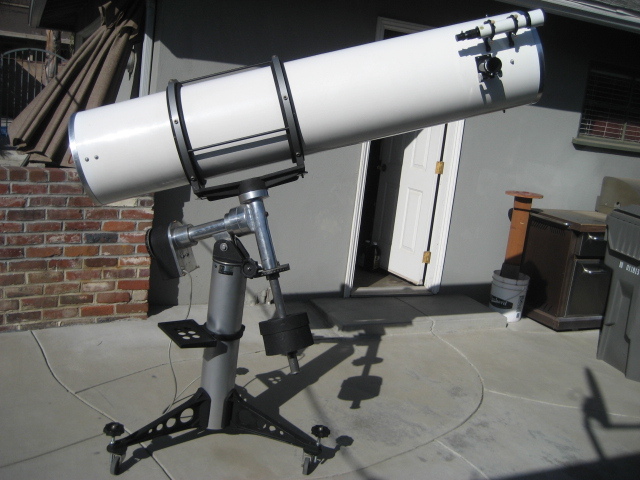 I also was able to go up to Prescott AZ for some very dark skies with this telescope, it was a real treat; things that could be barely seen from La Verne were bright and detailed from Arizona. It’s no wonder this state is filled with observatories and amateur astronomers! 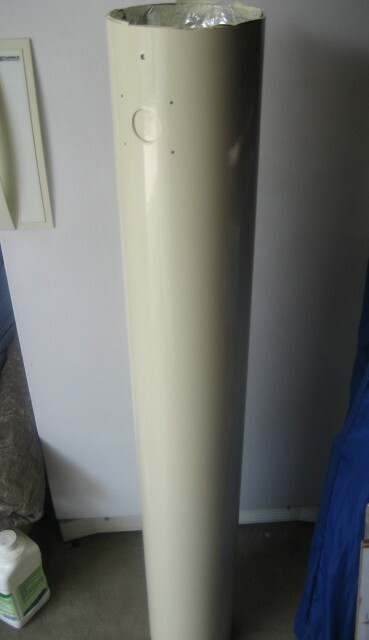 At the end of the summer, I recieved a very large telescope- a 12.5″ reflector. 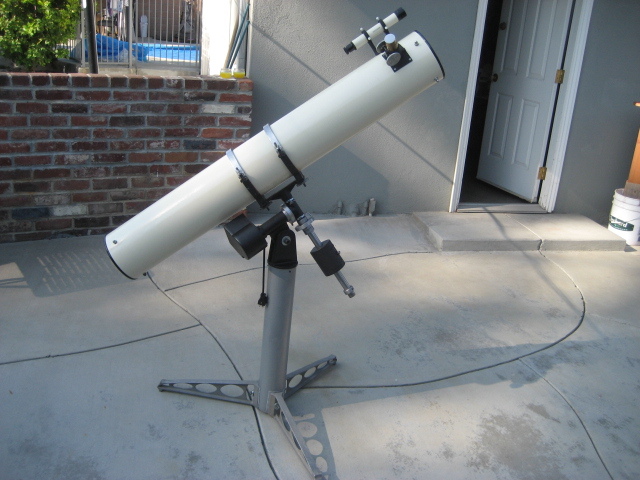 This scope is a Meade Research Grade 12.5″ F/6 Newtonian on a GEM. Yes, it’s a mouthful. The scope when I recieved it was in pretty good condition for the most part, just needed a really good cleanup. I finished in only 8 days! See that restoration here. 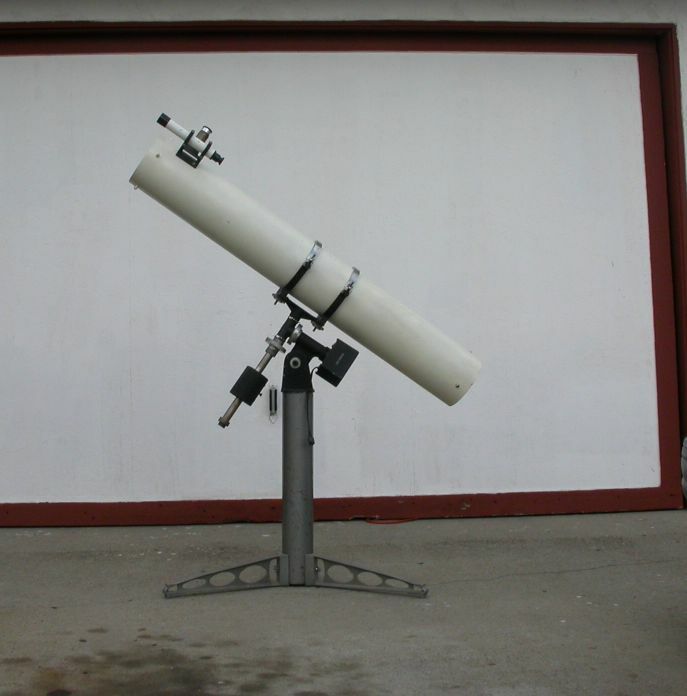 The telescope only takes a few minutes to set up, as it has casters on the legs, it can be rolled about and put away easily too. So, I’ve been doing quite a bit of stuff lately, I’ve been observing almost every chance that I can get. I have been getting up about 4:30 in the morning to see all the winter objects like the Orion Nebula, M37 star cluster, etc before it gets too cold outside. I have seen Jupiter with the 12.5, that was a real treat, a wealth of detail is visible, including (easily) the Great Red Spot. 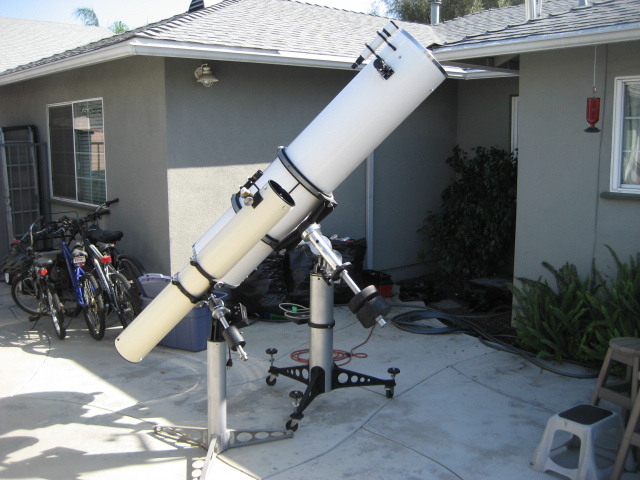 The one drawback of this telescope is that it requires a stepladder in many cases, but what’s good is that it has rotatable rings, so the scope can be rotated to where it’s more comfortable view at. So now the weekend is here! Time to take these scopes out for some viewing. Also, tomorrow is the SIA Expo in Woodland Hills, CA. Looks like it’s going to be a fun event, hopefully I’ll be able to go tomorrow. Website here. I also have some news regarding the 4″ F/12 planet killer that I did- it’s a dud! I found that looking closer at the mirror’s coated surface that a large grayish mass was in the center – due to pits not removed from polishing. I saw this when I got the mirror back from the coating company, but I had hoped for the best. The good news was that it did throw up an image, but unfortunately not a very good one. When the star is focused there disk of fuzzy light around it. Also, it doesn’t take magnification very well. The mount was very wobbly, it was better to just sit down and hold the tube in hand than to use it on the mount. The finderscope that I put on it was way too small to even find anything. But you know, even after all that work and determination, I’m not really that upset. I have done something else with it- I have started the project from scratch and have decided to do it again. It’s very common for the first mirror someone makes to not be very good, or even work at all. So I think this time around, It will go much smoother and quicker, as I have done it once before I know what to do / not to do. I have already ground to 220 grit and am right on track for exactly F/12 (48″). I plan to built an equatorial mount and mount it in a different, more rigid tube assembly. If this is done well, this scope should be a real “planet killer”! Also, 48″ isn’t all that long- I can still get the magnification down pretty low with the eyepieces that I have, as well as it being able to take a good amount of power, and it should be sharp sharp sharp!